Jethawanaramaya Stupa, originally 400 feet, was once counted in the list of the tallest monuments of the world and its scale was matched only by the pyramids in those times. Today, it may not be tallest but it is still a marvel to the eyes of the present times as it showcases its excellent engineering techniques and styles of its time. With the whole building constructed of bricks, this monument is largest such in the world. It was built by Mahasena, the king of Anuradhapura 2000 years ago and refurbished to its present form and height of 250 feet in 12th century AD by King Parakramabahu. 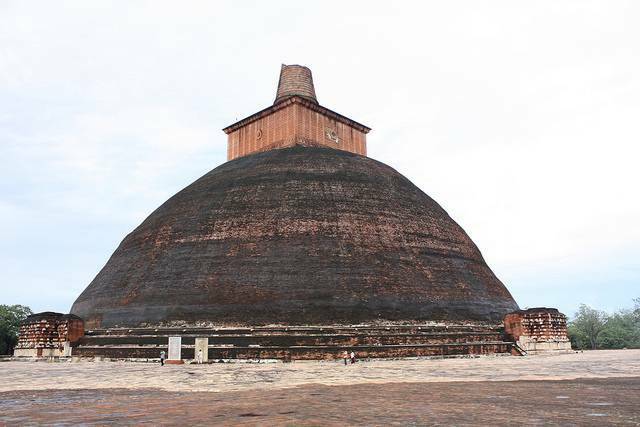 It is believed to have been constructed on the site of cremation of Mahinda. Not only Jethawanaramaya Stupa is historically significant but also it stands as an archetypal of the skills of bygone era which attracts tourism.